It feels strange writing a blog post since its been a couple of weeks, but tonight my mind was a blank and thats when I write about random stuff. Pouring over my Feedly links and Twitter when I came across this article. Sean Parker, of Napster, Facebook and having ‘Justin Timberlake play me in a movie‘ fame, was bemoaning the current state of Venture capital in Silicon Valley. The chorus has started, according to the holy of holy super angels, that the valley is in a Bubble, 1990’s style. It’s not like we couldn’t see it coming. With angels and VC investors bitching about valuations the next logical question is how could they have allowed this to happen again? Remember when Mike Arrington sort of walked into a bar of “Super Angels” and came to the rash conclusion via his sources that these “Super Angels” were colluding to keep the valuations of start-ups down? Maybe they were on to something. So while we praise Herr Arrington for possibly uncovering something that might have been illegal, lets pause and have moment of silence for the start-ups with incredibly foolish valuations or the start-ups that have no damn business being funded. Their already DOA or as TechCrunch has coined the term ‘deadpooled‘. Maybe they should have tried to keep those valuations down? 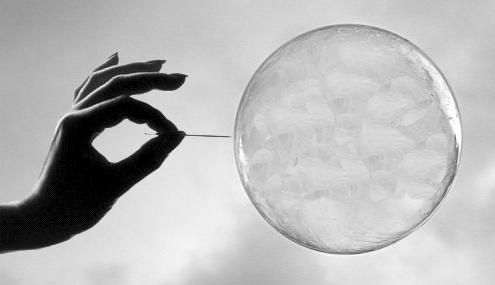 When the word got out and the holy-than-thou weighed in, the bubble began. The secret was out and the fools rushed in. When the general consensus is saying we’re in a bubble, I say this could have been avoided with a little bit of collusion. Forgive me I’m feeling a bit conspiratorial and evil tonight. This entry was posted in Thoughts at Random and tagged Bubble, Start-up, TechCrunch, Valuations, VC, Web2.0. Bookmark the permalink.